We guarantee our work to be professional and timely, using only the best materials with late model paving equipment. We consider every job important, large or small. Our combined years of experience makes the difference. Let us put that experience to work for you. We have the expertise to rebuild a failing road, parking lot or driveway to give you many more years of performance. We can excavate the old blacktop, re-grade, add a new stone sub-base, lay a binder course then a new compacted top coat. If your current asphalt base is satisfactory, we can lay a one and a half inch top coat to renew the look and life of your driveway, road or parking lot. B & J Paving Contractors, LLC , is a locally owned and operated company, in business since 2002. We are proud to live and work in Luzerne county. The company was originally established by Bill and the late Joe Janosky. Both provided B & J paving with over 30 years experience in the construction and paving business. Most recently came the addition of Bill Jr, with over 20 years experience in the same industry. 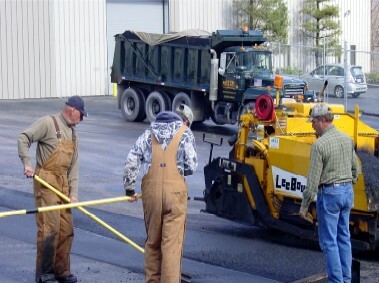 Very few companies have the experience or dedication of B & J Paving. "We don't just assign your job to our crew, we are the crew!" Copyright 2011 B&J Paving Contractors, LLC. All rights reserved.